I’m honoured and humbled to report that I’ve won in the Best Celebrity Blogger category of the Pakistan Blog Awards. The Unconference organized by CIO Pakistan and Google Pakistan for the first time ever in Pakistan was a fantastic venture and a glitzy ceremony! Their aim was to ‘discuss, recognize and platformize one of the the fastest growing online mediums in Pakistan, the blogging community.’ And I for one think they pulled it off fabulously! Thanks so much to Rabia Garib and her team, all the fellow bloggers who convinced and helped me to start a blog (Ammar Yasir of Teabreak, Jehan Ara of Pasha, Sana Saleem of Mystified Justice, who actually arrived at my home to set it up along with Poppy Agha), and DiscoMaulvi/Aly B who nominated me. I’d be remiss if I didn’t mention Faisal Kapadia and Awab Alvi for encouraging me by featuring me repeatedly on The Laidback Show. I demand a photo of the celebrity blogger, Please I am a big fan don’t disappoint me! 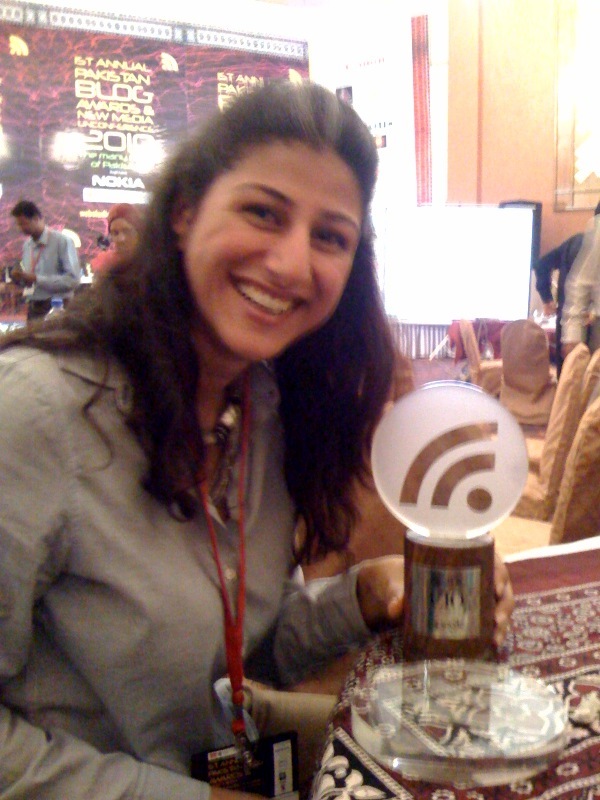 Cyberhugs Ms. Naqvi…well done and well earned. Hearty Congratulations on your award. It was a joy to read about it! May your positive thoughts, words and actions bring Joy,Peace and Abundance to the people of this great sub-continenet and to the rest of the world. Inshallah. May Khuda (your own Creative Intelligence , who is One with you) keep guiding and protecting you always and in all ways. Congratulations Naveen on your brilliant achievement. Congratulations! I am new on the blogging scene (my blog is named Burnout Rescue), and pleasantly surprised to see so many wonderful blogs and posts by Pakistanis. Azme Alishan would like to congratulate you on the win! You truly deserve it! Such initiatives like Pakistan’s first ever blog awards make us proud to be Pakistanis! We should have such events more often. All of us together can take this country to unimaginable heights of success! Finally the pic of the award is uploaded. Good to see you with the award. Sorry to have missed you yesterday Naveen. I got there after you left thanks to PIA who delayed my flight by about 5 hours. Delighted that you won an award. Well deserved. Like Sana, I demand a signed copy of a photograph of our celebrity blogger :-). Congratulations! Bohat mubarak, Naveen, you deserved it. Maybe someday we can see you back on Dawn News !!!! the very well-deserved award. one of the few sane blogs. Rawk on fellow blogger 😛 atleast we know a celeb that actually gives a damn. Congrats naveen. you deserved it all the way. Congratulations Naveen, as a celebrity and mainstream media journalist you have def. contributed a lot to bring Pakistani social media and blogosphere into lime light. I wish you all the best in all your future endeavors. The Miami guy, who tweeted at MAD…. Great! Congratulations to you Naveen . .. .